The following article is a shortened extract from the biograph y of Donald Perrens, written by Dennis Sawden, who kindly gave permission for it to be reproduced in the 2016 Association Newsletter. 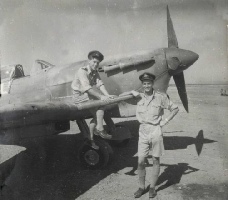 The photo depicts Donald (on the right) with his Spitfire. In October 1944 Donald Perrens was posted to join No 208 Squadron as a Sqn Ldr and flt cdr. The CO of the Sqn was Lt Col Blaauw of the South African Air Force. By this time, the Allied armies had advanced well up the leg of Italy and the Sqn was based at Peretola, on the northern outskirts of Florence, just to the south of the Apennine Mountains. He was by then one of the most experienced Army Co-op pilots in the wing and he was asked to organise a special artillery ranging mission. The target was to be a German ammunition dump about one mile SW of Bologna. Because the gun was sited in the mountains, it was essential that Donald should fly at a high enough altitude to maintain line-of-sight VHF radio contact with the gun battery - and also to avoid fire from four German flak positions known to be sited around the ammunition dump. Donald was told that the gun director would tell him via RT when the big gun was fired and that the shell’s time of flight for the 15 miles would be 70 seconds. It was decided that Donald and his No 2 would fly at 8000 feet, to enable him to keep clear of the flak, but also so that he could observe the fall of shot, and then give corrections to the gun director. On 22 January, the day dawned fine and clear, providing perfect conditions for the vital task. Donald had Fg Off “Digger” Alexander, an Australian, as his No 2. They made contact with the Sector Controller (callsign “Cooler”) and climbed quickly, crossing the mountains at 10,000 feet, and map read their way to the Bologna area, arriving 15 minutes after take-off. Donald quickly identified the German ammunition dump target from the photos and noted that there was no movement at the site, although the tracks of vehicles could be seen in the snow. He identified as well the German 88 mm flak battery just to the north of the dump. Having made contact with the gun director, they were ready to start and the first shot was fired: Donald knew that spotting the first fall of shot was critical and the 70 seconds wait seemed interminable, but he saw the first shell strike. By now the Germans had twigged what the two Spitfires above them were doing and the flak batteries opened fire at Donald and his No 2. The flak became so intense that Donald and Alexander were forced to climb higher and by the time Donald called the Gun Director to tell him “Target Registered”, they were holding at 12,000 feet. After 12 rounds had been fired, Donald reported two direct hits, a fire and destruction of the target. Having completed the aim of the mission, Donald could have returned to base, but he called the Gun Director and asked if he was prepared to register onto the flak batteries? This was agreed and the second registration began, but, after observing the first two shots on the new target, the engine of Donald’s Spitfire stopped suddenly.